Is wheat free gluten free? In a word, no. Products that are labeled wheat free are not necessarily gluten free. 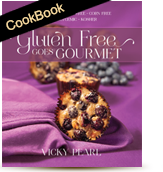 They may still contain rye, spelt or barley based ingredients that are not gluten free. Can I eat a little bit of gluten and avoid it most of the time and still feel okay? If you have Celiac disease, you must adhere 100% to a gluten free diet. If you are diagnosed with a gluten sensitivity, on the other hand, most probably as well but do check with your health care provider. Gluten is the generic name for certain types of protein contained in wheat, rye, barley and spelt. Gluten sensitivity is a sensitivity or reaction to ingesting gluten whose symptoms range from fatigue and difficulty focusing to anxiety, depression, thyroiditis, arthritis, diarrhea and skin conditions. Although the symptoms of both may seem or are similar, they are, however, very different clinically. Recent research indicates that the indigestion and possible inflammation that results from ingesting gluten may lead to flattening of the villi of the small intestine which is what characterizes the more clinical celiac disease. All forms of malt, (malt extract, malt flavoring and malt syrup) are derived from barley and thus should not be a part of a gluten free diet. Do not confuse this with sugar alcohols or substitutes such as maltitol, maltodextrin and isomalt, which are gluten fee in food products. Is modified food starch gluten fee? To ensure that modified food starch is gluten free, you just have to be a bit of a sleuth. Check the words that are contained in the brackets immediately following “modified food starch”. It will typically contain corn or less typically tapioca, potato or wheat. If it mentions the latter, refrain from buying it. Do I need to avoid MSG on a gluten-free diet? MSG was considered questionable until recently. It is now acceptable for a gluten free diet but you might want to ask yourself if it is acceptable as part of an overall healthy diet. Is spelt and/or Kamut gluten free? No, these grains do indeed contain protein and hence gluten. Is vinegar okay on a gluten free diet? Distilled vinegar is gluten free while malt vinegar is not distilled, and therefore not gluten free. Even vinegars that are not typically distilled, such as red wine, balsamic, apple cider and rice, are also permissible on a gluten free diet. All oils are fine for those following a gluten free diet. Are distilled alcoholic beverages and beer gluten free? Distilled alcoholic beverages such as gin, rum, vodka and whiskey, do not contain any harmful gluten peptides or prolanines. Research indicates that the gluten peptide is too large to carry over in the distillation process. Therefore, this leaves the resultant liquid gluten free. Wines and pure liqueurs are also gluten free. Beer and lager are not distilled and are fermented from grains that contain gluten and therefore are not allowed on a gluten free diet. Luckily, there are now some gluten free beers available on the market. These are made from sorghum as well as from rice, millet and buckwheat. Be sure you check the label to ensure the ones you are buying are gluten free and kosher. What makes dairy so problematic? Much like the protein in wheat is the culprit for those with gluten sennsitivity, so it is with dairy. The protein in dairy is called casein and it is the casein that many people have difficulty digesting or to which they have a sensitivity. Is dairy free and lactose free the same thing? These are actually two distinct sensitivities. People who have a dairy sensitivity, as shown in the previous question, are actually sensitive to the protein called casein, found in so many dairy products. Individuals who suffer from a lactose intolerance or sensitivity actually lack the enzyme that aids in the breakdown of the milk sugar found in milk and other dairy foodstuffs. This enzyme is called lactase. Be mindful when examining ingredient lists. Although a product might seem to be dairy-free, check for the words casein or caseinate. You will be surprised at the range of ingredients that contain them. Kosher pareve foods are all casein free. Are all people who are gluten free also dairy free? There is a distinct correlation between people who follow a gluten free diet and those who choose to live dairy-free. Many people who opt to live without gluten also happen to choose to live dairy free. This is true of many but certainly not all. I have heard that many people return to eating dairy even though the remain on a gluten free diet. Is that true? Yes, it can definitely be true. As a person’s health improves, and their digestive system strengthens, many but not all find that they can tolerate the re-introduction of dairy, albeit in smaller and more moderate amounts. There are, of course, people who remain dairy free because they feel healthier without consuming dairy. If I am sensitive to corn, what should I look for on an ingredient list? In addition to being listed in its natural state, corn may be listed as but not limited to: cooking oil, cornstarch, powdered sugar, baking powder, xanthum gum, corn syrup, maize, modified food starch, caramel color, citric acid, natural and artificial flavors, brown sugar, fructose, xylitol, artificial sweeteners and distilled white vinegar. Is it possible to avoid corn? Although it may seem impossible, it can definitely be accomplished. Different reactions require different levels of restriction. You may find that you cannot tolerate eating corn on the cob but can eat some scones made with baking powder. Likewise, you may not be able to consume corn syrup due to its high concentration, but may be able to tolerate frying a chicken breast in a small amount of corn oil. It’s important to review your eating habits with your personal physician and come up with a individual eating plan. There are numerous websites that you can visit to learn more about celiac disease and about living gluten fee. Two of the more reliable sites are those hosted by the Celiac Sprue Association and that of the Celiac Disease Foundation. Visit either to discover even more recipes, how to join an online community as well as be privy to the latest scientific information as well as legislation governing labeling. If you want to join a local chapter where you can meet in a support group or even visit an expo highlighting hundreds of gluten free products, be sure to visit either of the two listed immediately below. Another wonderful resource you should know about is called “Living Without”, a magazine and website that is filled with tons of information. It has recipes, great cookbook and product reviews, synopses of scientific studies as well as real life testimonials. These are the three main ones I recommend. Check back with us from time to time as I will be adding more information and hopefully more links.